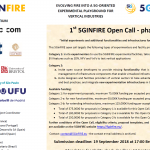 The first open call of the 5GinFIRE project closed on 28 February 2018, 17:00 CET with an overwhelming number of submitted proposals that proves 5GinFIRE addresses the right topics at the right time and has an appealing offer to the industry and academic community in Europe and beyond. In total 43 eligible proposals were received, requesting more than 3.4 million €, and which are competing for a total available funding of 0.75 million €. So, the competition is high. For category 1 (experiments) a total of 25 proposals were received, requesting almost 1.8 million €. Remarkably 12 proposals were received from SMEs, representing almost 50% of the proposers. 2 proposals were received from industry, 7 from academia and 4 from research institutes. The origin of the proposers is well distributed across Europe with proposal received from 12 European countries. The highest number of proposals were received from Greece, Italy and Spain. Considering the funds available for category 1 and the funding limit per experiment, 5 proposals will be granted. For category 2 (new infrastructure functionalities and additional infrastructures) a total of 18 proposals were received, requesting more than 1.6 million €. Also in this category SMEs were very active with a total of 6 proposals. 7 proposals were received from research institutes, and 6 from academia. Proposals in this category were received from 10 European countries, whereas in this category the highest by far number of proposals were received from Spain (33% or 6 proposals). Considering the funds available for category 2 and due to the different funding limits per sub-category we are expecting between 3 and 6 proposals to be accepted for funding. We are looking forward to the evaluation of the proposals by independent experts and to start working with the best teams in Europe that have expressed their ideas on how to utilise 5G infrastructures, how to extend these and what additional functionalities are meaningful and useful to the community. Finally it is worth mentioning that we received expressions of interest also from countries outside the EU and Associated countries and we interpret this interest such that 5GinFIRE has a global impact. Unfortunately we are not able to grant funding to organisations from non-EU/Associated countries. The successful proposals are expected to start working with the 5GinFIRE in May 2018.